I was shifting through bird names and I pulled up, Dickcissel. Then I Googled the Dickcissel’s picture; he looks similar to some of the smaller song birds I saw in the Blue Spruce just outside the window next to the computer. Then I played the Dickcisselcall/song, both Sanosuke and Kaoru sat up and listened. As the young cats ran out of the room my attention turned back to checking my email. I had closed the site with the bird’s song, so when I heard a bird singing again I automatically rechecked my task bar. It’s like checking if I left the iron on…not that I use the iron anymore. It took me a minute to realize, that singing bird was coming from outside the window, in the Blue Spruce. And that bird was talking to my computer. Hmmm! What all this rambling means is I added a Dickcissel to my list of birds I have seen and heard. I took this picture while standing in the kitchen, hiding behind the counter and zooming in through the window. 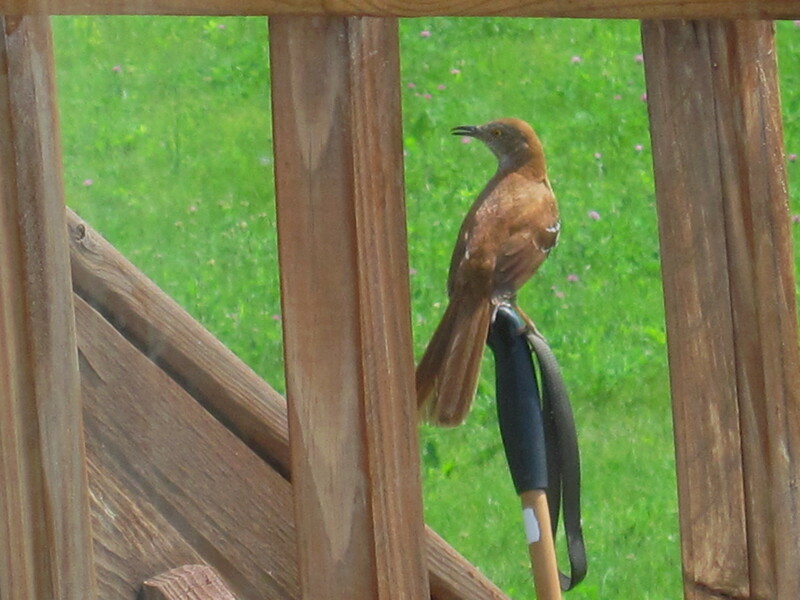 The bird, I believe, is a Brown Thrasher. I played the Brown Thrasher’s song and Sanosuke and Kaoru went crazy, again. I really shouldn’t laugh when they start jumping from window ledge, to window ledge all excited, but I couldn’t help myself. For fun, I put together this video. Enjoy! You are wonderful William, be careful at work. Glad you enjoyed this. Oh, the video is so cute. I love watching animals, they give us human so much joy. Yes I agree with you, I believe the bird is a Brown Thrasher. I love sitting on my patio early morning and late night listening to the birds. It is so peaceful. I never saw a Brown Thrasher before this year. They must have stayed away from the house. I agree, a bird song is so peaceful. cats lick each other to take bath, what fun! Thank you! They are cute! its such a divine delight to hear birds sing. That really was kinda mean! I do stuff like that all the time, it is just way too funny! Half of the birds I see and hear, I have no clue what kind they are. They are just so neat to watch and listen.